This is completely unrelated to the rest of the site, but one of my other hobbies is precision target shooting. I have been messing around a lot lately with the venerable 7.62x54r cartridge because of its vast supplies of affordable surplus. I have accumulated surplus rounds from various countries and found that some are much more accurate than others. A lot of people say “Find the surplus that your rifle likes”, I have found this statement to be false since some of the variances of these surplus’s are so high, they shouldn’t shoot accurately from anything. Unless your bore diameter is way off, you can expect ammo that has tight tolerances to shoot more accurately than ammo that has high deviations. Pretty much common sense. Whats maybe less understood is that even though tolerances for a given ammo may be very closely held, it could be loaded for extra velocity which can effect accuracy. By backing the load down a little, you may be able to get more accuracy from this cheap ammo. Sorting the bullets by weight helps significantly as well. Here is data from various surpluses and manufactures of 7.62x54r. I have compiled this data to aid in ‘accurizing’ this ammo. 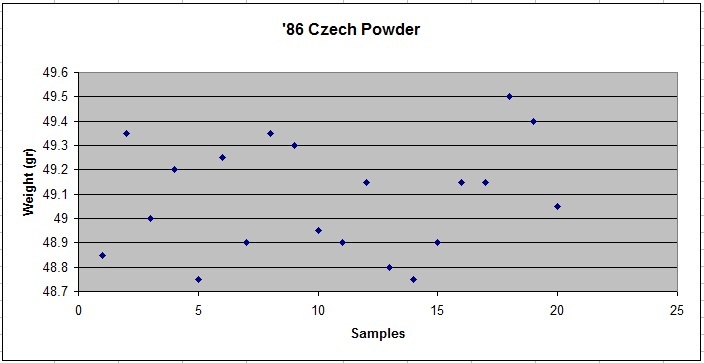 I will also add data from the hand loads I am working on. All weights are in grains. All ammo was shot though my “Accurized” PSL with a 20″ barrel and target crown. *Note* I will not be updating this info anymore. I have had to give up shooting due to a rare ear condition that I would never wish onto anyone. Even though I always wore ear protection, it wasn’t enough. My advice is to use muffs with the highest rating you can find, and if they are not rated high (Less than NRR 25 is too little) double up with plugs. 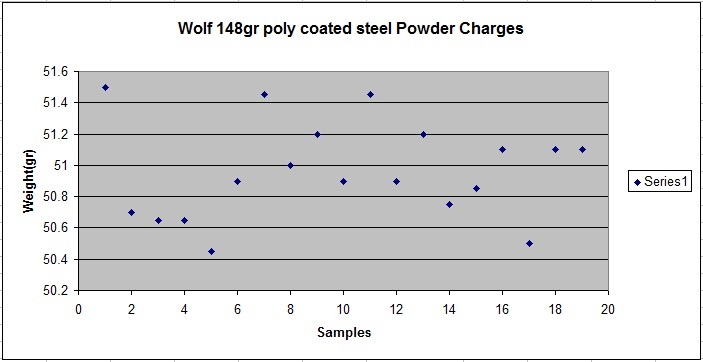 Data from a box of 20 Wolf polymer coated 7.62x54r. Its been a while since I shot this ammo, but it made very large groups. I also noted that virtually all of the bullets seemed damaged by the factory crimping process. These flat base bullets do not have a cannelure and are crimped so hard that the jackets on the bullets are distorted. This seems to be the worst ammo available. I have to say that this box seems way better than some of the others I have done (but didn’t record). 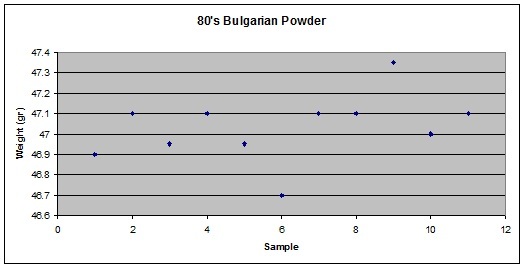 Both the bullets and powder are more consistent than what I have seen out of Russian surplus in the past. I have seen bullets ranging from high 148’s to low 146’s, and charges much worse than this. 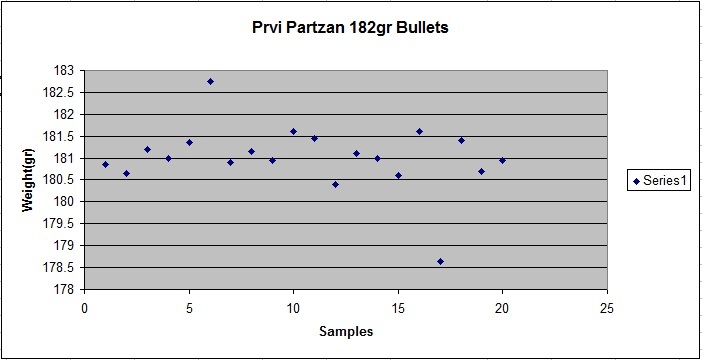 I was surprised to see that there was only 2 bullets in this group that where 148gr or over. This surplus has always had a higher point of impact than anything else I have shot. It has also never been accurate enough to make what I would call a group. I think this ammo is loaded a little hotter which is probably beyond the point of good accuracy. 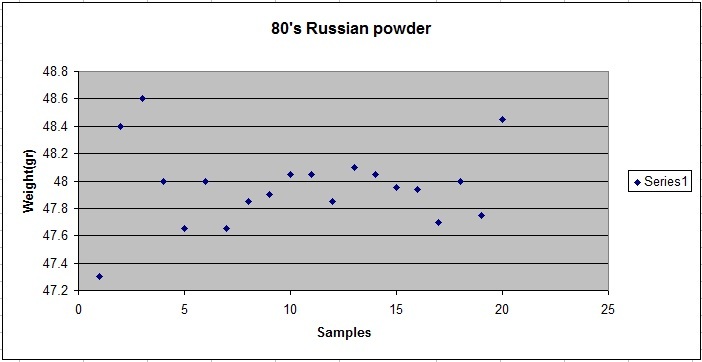 Even though this powder is more consistent than the 80’s Russian, the bullet standard dev is higher causing poor accuracy. That’s a shame since these bullets have a nicely formed base which should lend itself to better accuracy. The sample size for these is 11 since I used an already open, half used box. 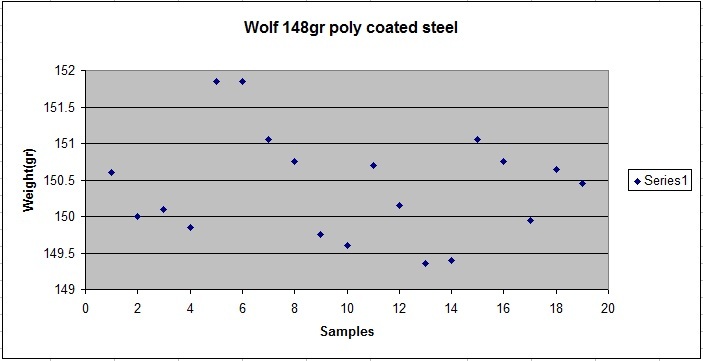 But, even with the smaller sample size; it was easy to see that this ammo was much more consistent than the Wolf or anything else. I have always had the best groups with the Bulgarian surplus. I didn’t record but also noted that the cases were trimmed much more consistently than the wolf. This is some of the best 7.62x54r surplus I have shot. Uses a different kind of powder compared to anything else. This powder is very fine and dense, 47gr of this leaves quite a bit of space in the cartridge. Because of this, you have to be careful not to double charge. 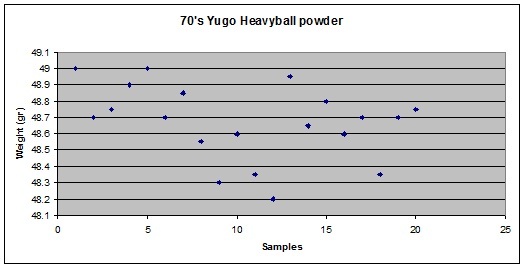 1976 Yugo 182gr pull data. I don’t have very much of this ammo and haven’t shot a lot off it. But I remember it being very powerful but inaccurate, about on par with run-of-the mill surplus. Notes: This ammo was very hard to pull since it is sealed with a tar like substance. The amount of effort required to pull these was very inconsistent with some requiring pretty much all of my strength while others came out much easier. I expect this to poorly effect accuracy. I also don’t like this bullet design. It looks like they poured liquid lead into an empty jacket. The base of bullet looks like a paint can that’s 90% full with a very thin and sharp flange of jacket around it. Usually I don’t have to run the brass (or steel cases) through the resizing die since its never been shot before; but I noticed that the bullets had play in the neck of the case when I was reassembling this ammo. That tar sealant must have been the only thing holding these bullets in place, and I cleaned all of that off before I weighed them. After resizing (and unloading/loading all of the charges again), the necks where much tighter and the bullets were held securely. 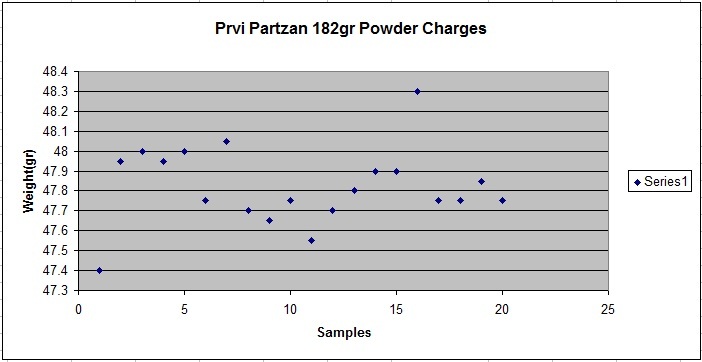 Prvi Partizan 182gr pull data. I have not shot this ammo yet but I expect it to perform very similarly to the 70’s Yugo 182gr surplus. Both this ammo and the Yugo are made in the same plant except that the Prvi is for the commercial market. 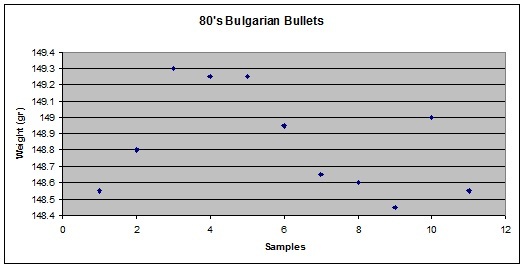 The bullet design is identical to that of the Yugo. Notes: Identical to the 70’s Yugo except that the cases are Boxer primed and non-corrosive. 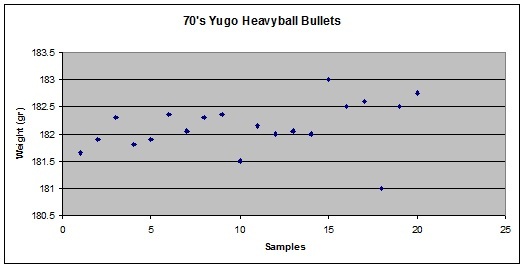 Both bullets and charges averaged about a grain lighter than the 70’s Yugo surplus. These bullets do not have any sealer on them like the military surplus does, I would expect that these would be a little more accurate since the bullet would be able to leave the case more consistently. 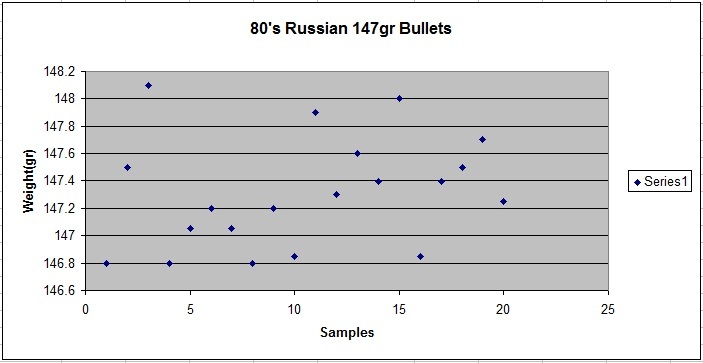 All of the bullets were in the 180-181gr range except for two, and those were quite a bit off. These bullets weighed 182.75 and 178.65gr. If I remove those from the sample, the STDDEV is 0.343. I never had the chance to test these and never will, but they looked like real winners. The original load developer used Lapua brass, but that’s too damn hard to find and expensive. I would have used surplus cases to see what have happened. Work your way up because these are untested. If you do load these up, send me a message to let me know how they did. 5 Comments to "7.62x54r Surplus Load Data"
Cool info, thanks for sharing. I was curios about the PPU 182. I recently purchased Winchester 182-grain SP (7.62x54r) and I have yet to shoot them. Was your PPU 182 FMJ? How did your PPU 182 perform? I haven’t shot my 182gr PPU stuff yet, I don’t have very much of it. It its FMJ and it looks exactly the same as the 70’s Yugo, so I expect it to perform like the surplus. The Winchester ammo may use Sierra Match King bullets, if thats the case, it will be much better. 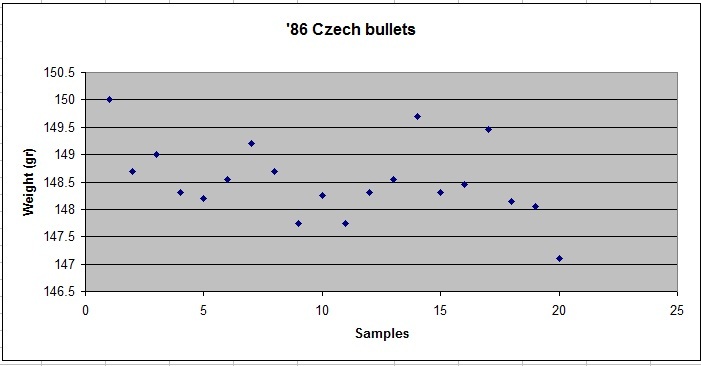 Nice data collection, I would recommend looking into some Match surplus ammo 182 gr. by Factory 188. I got sub to 1 MOA on my heavily accurized PSL. Email me if you like to discuss more about the PSL and Ammo. I have shot the PP 182gn BT-fmj fron a custom made 1943 Ishvesk receiver and a Czech UK-59 barrel. Easily sub MOA at 100 yds. didn’t have to adjust my scope or anything although I’m going to have to get used to a Timney trigger with a 2.5 lb pull weight. Pretty decent ammo. I recently acquired an M1895 this was to load 150gr with 47 gr ADI 2208 worked well enough but I have never seen a reloder 15 data thanks for this info sir .